All tertiary students already carry student concession cards to prove that they are studying. Other states like WA and NSW have found solutions to fare evasion that don’t include forcing students to possess a third card that requires students to wait indefinitely after lodging an application. The policy costs the government money to cover administration, and it forces universities to spend student fees on processing TTCC applications instead of on teaching and learning. Because of delays in processing TTCC applications by universities and Translink, students either have to pay full fare while they’re waiting for a TTCC or fare evade and run the risk of a fine. What I find interesting about the planned rally is that the students don’t appear to be against the policy intent of the TTCC. 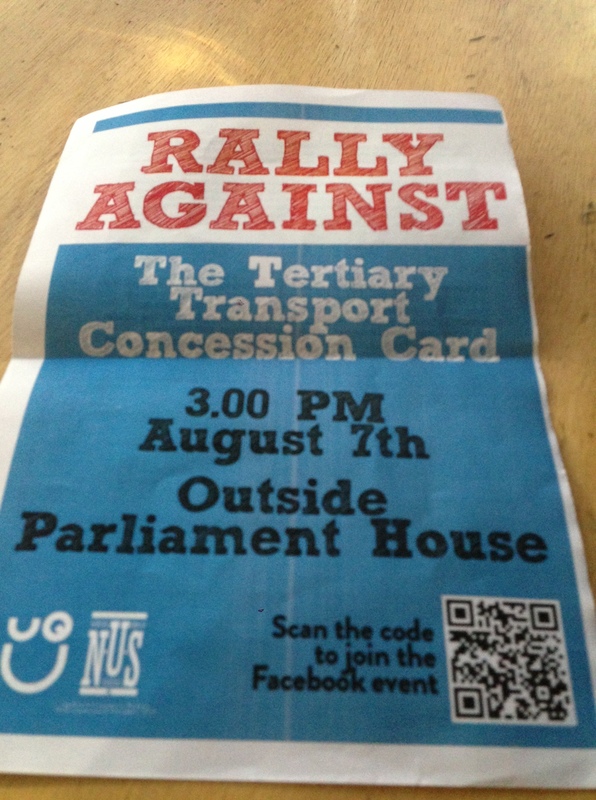 The flyer appears to imply the Student Union might support an alternative approach to ensuring only genuine students get concessions, such as the approach in Western Australia, where the Transport Department and universities share data so genuine students can be identified on their Go Card equivalents. This sounds like a reasonable alternative and should have been considered by Translink. This entry was posted in Transport, Uncategorized and tagged nus, publictransport, qld, queensland, translink, ttcc, uq. Bookmark the permalink.